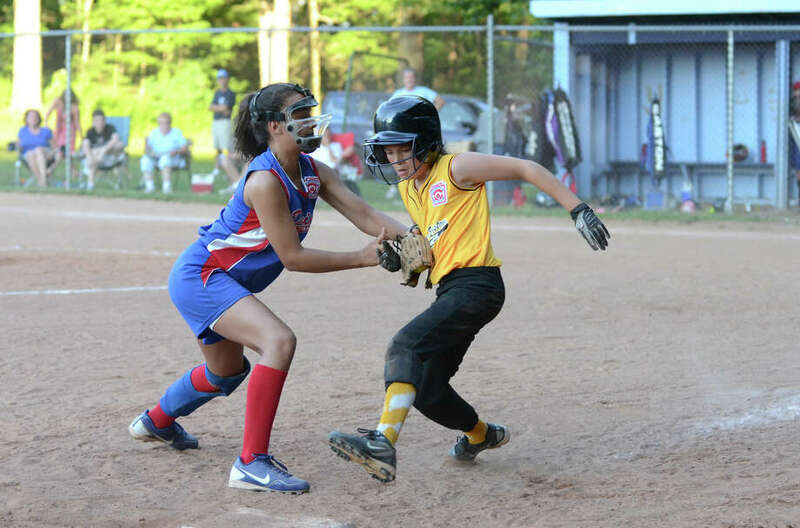 WILTON -- To gauge Darien's dominance in this season's Little League Softball 12-U District 1 Tournament, consider the thoughts of Redding-Easton manager Rich Colangelo following Monday's tourney final. "At least we went five innings with them," Colangelo said after Darien earned a berth in the Sectional Tournament with a 10-0 win over Redding-Easton. Darien (5-0) won all four pool play games by the mercy-rule margin of 10 runs and Monday's result was just the second time the D-1 champs were pushed to five innings. Winning pitcher Sophia Barbour allowed one hit while Zazi Fee had two hits as Darien captured the championship for the third consecutive year. Darien faced the District 2 champion, Fairfield or Black Rock on Thursday in Shelton, but the result was not available at press time. For coverage, visit www.dariennewsonline.com. "Sophia pitched great today -- lately she's been a strike machine," Darien manager Perry Pierce said. "When she's on she makes me look smarter than I really am. We won all of our games by 10 runs but this was a 2-0 game in the fourth." Before Redding-Easton starting pitcher Caitlin Colangelo tired in the fourth by walking three consecutive batters, which set off a seven-run Darien rally, it was far from certain that Darien would be returning to the Sectionals. "The Darien pitcher was always right around the plate," Colangelo said. "Then, in the fourth, we had some walks and they got some hits, and there were some hits that should have been outs. But I'm proud of them." "I think at first the girls were nervous because it was the first game that they didn't have a safety net," Pierce added. "But then we just relaxed." After Caitlin Colangelo's control problems in the fourth, Fee, Cassidy Schiff and Emily Gianunzio followed with RBI singles. Two wild pitches scored runs and a throwing error brought in a third run. In the fifth, Caleigh Morr led off with a single and eventually scored on a wild pitch for the clinching 10th run. In the first inning, Fee doubled and came around on a wild pitch, and Leela Krishnan's RBI double made it 2-0 in the second. Bianca Criscuolo had Redding-Easton's only hit, a second inning infield single off Barbour. Because of upcoming off days, Barbour will be able to pitch in three of the team's four pool play games, and then in the final (July 11) if Darien can finish among the top two in the five-team tournament. "We been there three years in a row, but our play hasn't been up to snuff," Pierce said. "But I think if this team puts it together, we can be successful." Records: Redding-Easton 3-2, Darien 5-0. Batteries: RE--Caitlin Colangelo (L) and Gabrielle Colangelo; D--Sophia Barbour (W) and Emily Gianunzio. Doubles: D--Zazi Fee. Triples: none. Home Runs: none.